What happened to the teen summer job in America? What Happened to the Teen Summer Job? The teen summer job was once a rite of passage. Now, it’s a rite that may have passed. According to a new report from Pew Research Center, summer employment among teens has trailed off dramatically over the past few decades. Where in the 1970s, 1980s, and even 1990s a reliable 50-ish percent of teenagers were employed during the peak summer months, nowadays less than a third find summer work. To be fair, that’s a bit of an oversimplification. As Pew notes, teen employment has historically followed the patterns of the market—climbing during economic booms and falling during and after recessions. Still, the ranks of employed teens have typically hovered between 46 percent and 58 percent during the summer, and over the past few years have slipped well below that. 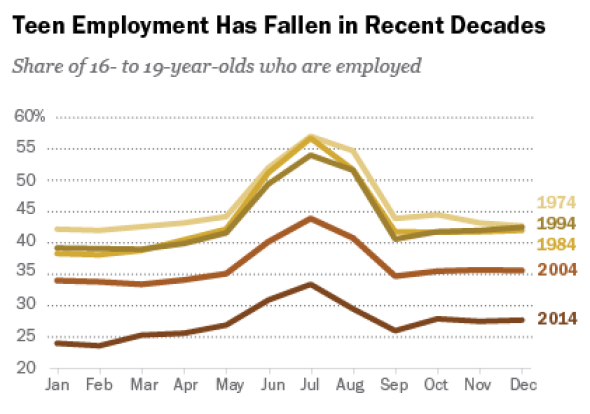 It’s not shocking that teen employment plummeted in the wake of the Great Recession. What is surprising is that since hitting a low point of 29.6 percent in 2010 and 2011, teens have barely recovered, with their summer employment rising to just 31.6 percent last year. Pew Research Center. Data from BLS, not seasonally adjusted. Looking for an explanation? For starters, we’ve lost entry-level jobs. The most basic tasks that companies once might have hired teens or other young workers to perform are increasingly being automated to cut costs. Teens are also staying in school longer than they used to. By one estimate, states raising their so-called maximal school leaving age accounts for 1 to 2 percentage points of the overall decline in teen employment. Other teens are opting for volunteer work, unpaid internships, and other “pre-college” sorts of programs during the summer over traditional jobs. There also appears to be an access gap to summer employment. Recently, researchers have found that teens from low-income families were less likely to find summer work than those from wealthy households. 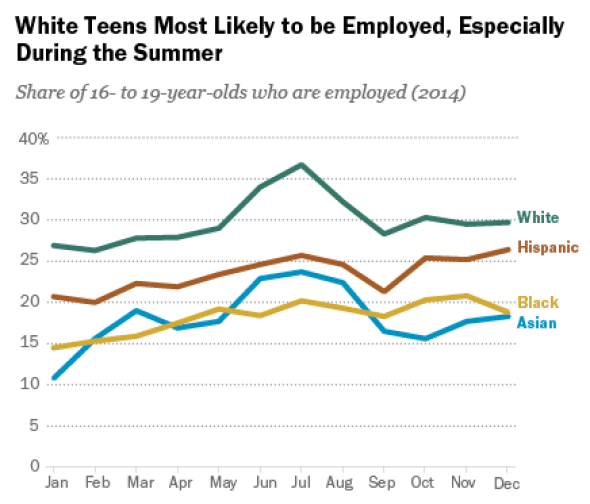 White teenagers are also more likely to land summer jobs than black, Hispanic, or Asian ones. Perhaps most importantly, though, lots of teens just don’t want to work anymore. That could be related in part to teens forgoing jobs for internships and other résumé-padding activities, but it could also just be that fewer of their friends are working, so they’re less inclined to do so as well. As you can see in the chart below from outplacement firm Challenger, Gray & Christmas, the number of teens who want a job has stayed relatively consistent over the past two decades. 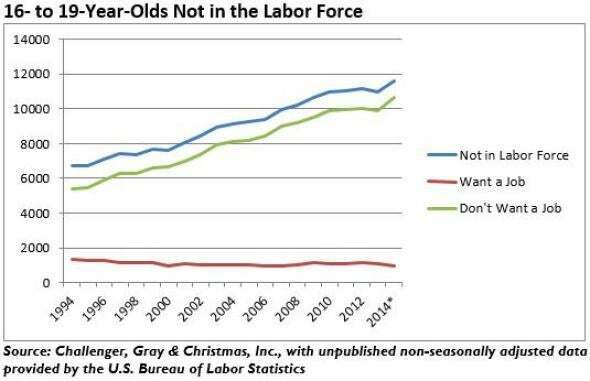 The number who don’t, on the other hand, has risen alongside those not in the labor force. So, as with lots of things in the economy—and with teens—the best answer is that it’s complicated. But the teen summer job isn’t what it used to be.